I'll be honest, I don't think I would have picked up the Mistmantle Chronicles by M.I. McAllister if I didn't have this crazy idea to do a whole week of reviews of books with squirrels as the main characters. I read Brian Jacques Redwall and enjoyed it but was not compelled to read the rest of the series. So, I was pleasantly surprised by Urchin of the Riding Stars and my inability to put it down. 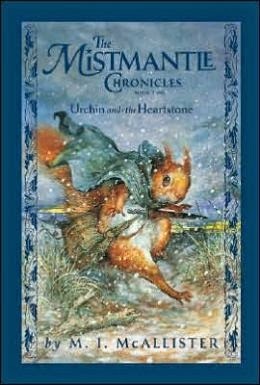 The fact that it is half the length of the average Redwall book and written at a lower reading level might have been a draw, but, the magical island of Mistmantle, the beautiful illustrations at the head of each chapter and the presence of hedgehogs kept me reading past my bedtime! The Isle of Mistmantle is named so because of the dense mist that surrounds it, allowing visitors from other islands to come and go, but inhabitants, once they leave, can never find their way back through the mists. The book begins with a mother squirrel in labor and alone on a beach at night. I'll admit, this is definitely one of the stranger beginnings I have ever encountered in a children 's book and, having been through labor a few times, I found myself trying to empathize with this squirrel. 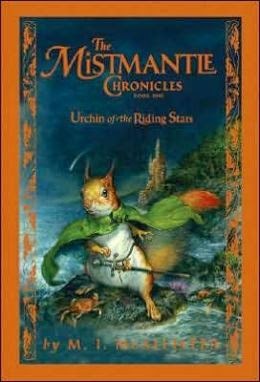 The mother squirrel has stowed away on a boat bound for the Isle of Mistmantle because a prophecy (He will bring down a powerful ruler) has put the life of her child in jeopardy. She dies after giving birth and minutes later her baby is plucked from the shore by a hungry gull and carried high into the air. However, this is the night of the riding stars when wonderful, momentous events occur. Startled by a shooting star, the gull drops the baby, who lands in shallow water and is washed ashore. Thinking it is a shooting star fallen to earth, the gentle, simple minded squirrel Apple rushes off to find it. The fall is also seen by Captain Crispin and Brother Fir, both squirrels, and they the shore, reaching the baby first. Determining that he must be an orphan, because no mother would abandon her child like that, and that he must be from another island because of his pale coloring, the decide that they will give him to Apple to raise and keep secret the fact that he fell from the sky. He is "different enough from the other squirrels without them thinking he came tumbling down out of the sky on a night of riding stars," says Brother Fir wisely. Crispin agrees and asks if he can name the orphan Urchin, since he was found on the shore. From here much tribulation and anguish occur before Urchin has the chance to fulfill his prophecy. Husk, a squirrel captain with ulterior motives and a touch of evil, begins to wield his influence over King Brushen and Queen Spindle after young Prince Tumble is found murdered after another night of the riding stars. The Royal Family are hedgehogs. Other inhabitants of the island include moles and otters. There is a saying among the animals of Mistmantle, "As bright as a squirrel, as loyal as a hedgehog, as determined as a mole, as valiant as an otter," and all of these animals, each with their own skill, work in the tower and serve the royal family. The day before the night of the riding stars, Crispin asked Urchin, who had been assigned to join a work party, to be his page instead. Cripsin has been a hero of Urchin's, even though he doesn't know the role he played in his rescue, and it has been his greatest wish to work alongside him. However, this doesn't last for long. Husk manages to frame Crispin for the young Prince's murder and sees him banished from the island. Urchin then becomes Captain Padra, an otter and Crispin's closest friend along with Brother Fir, page and together they work to keep Husk from increasing his control over the King and escalating his dastardly plans which include culling weak, undersized and less than normal infants as well as the work parties and the hours they must give to the king. Padra, Brother Fir and Urchin search for clues and form alliances while Crispin makes his way to an island where swans rule and the animals live undomesticated lives. He even finds a mate, Whisper, and they being a life together. The treachery of Husk and the beautiful, duplicitous squirrel he marries, Lady Aspen, the Queen's dearest friend and lady-in-waiting, can be intense for young readers and listeners. The murder of Prince Tumble - a knife through the heart - is disturbing, as are the mentions of the cullings that Husk has performed. However, Captain Padra has discovered the location of the ancient Old Palace that all the other animals believe to be a myth. There he has set up a nursery where the infants he saves from the cull can be raised and visited in secret by their mothers. Also, there is religion on the island, the center of which is the Heart. The Heart cares for the island and created the Mist to protect it. The Heart also protects the helpless. Other than that, the mention of the Heart and it's place amongst the creatures of the island is spoken of only peripherally but reminds me of the religion in Frances Hardinge's Fly By Night, the center of which was the Heart. This book sounds wonderful for my son, who is four and loves _Redwall_, though it's a little too long. I have a seperate question, though: what happened to your review of _Fog Mound_? It was listed in my RSS feed, but it seems to have disappeared from your website. Could you republish it? I think I enjoyed it so much because it was shorter, too. Fog Mound posts tomorrow! Every once in a while I accidently publish instead of schedule a post... Don't miss it, though. I really liked the book and am reading the second!